In Biblical usage, incisions or gashes in the flesh. 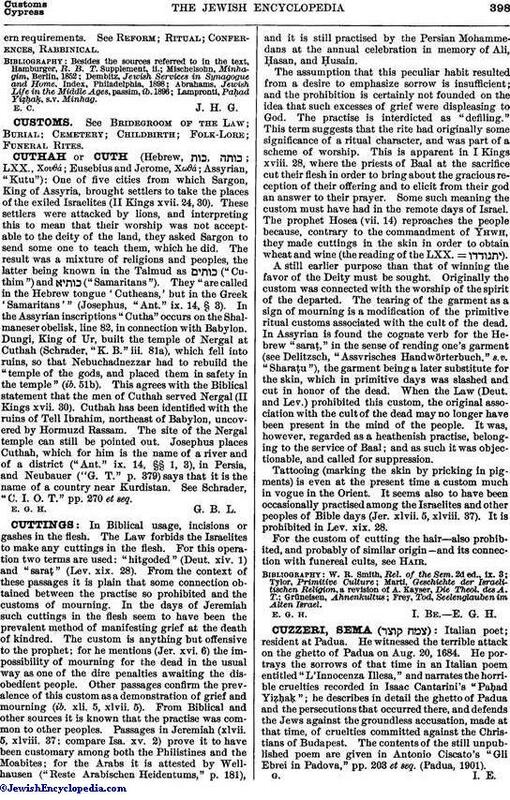 The Law forbids the Israelites to make any cuttings in the flesh. For this operation two terms are used: "hitgoded" (Deut. xiv. 1) and "saraṭ" (Lev. xix. 28). From the context of these passages it is plain that some connection obtained between the practise so prohibited and the customs of mourning. In the days of Jeremiah such cuttings in the flesh seem to have been the prevalent method of manifesting grief at the death of kindred. The custom is anything but offensive to the prophet; for he mentions (Jer. xvi. 6) the impossibility of mourning for the dead in the usual way as one of the dire penalties awaiting the disobedient people. Other passages confirm the prevalence of this custom as a demonstration of grief and mourning (ib. xli. 5, xlvii. 5). From Biblical and other sources it is known that the practise was common to other peoples. Passages in Jeremiah (xlvii. 5, xlviii. 37; compare Isa. xv. 2) prove it to have been customary among both the Philistines and the Moabites; for the Arabs it is attested by Wellhausen ("Reste Arabischen Heidentums," p. 181), and it is still practised by the Persian Mohammedans at the annual celebration in memory of Ali, Ḥasan, and Ḥusain. The assumption that this peculiar habit resulted from a desire to emphasize sorrow is insufficient; and the prohibition is certainly not founded on the idea that such excesses of grief were displeasing to God. The practise is interdicted as "defiling." This term suggests that the rite had originally some significance of a ritual character, and was part of a scheme of worship. This is apparent in I Kings xviii. 28, where the priests of Baal at the sacrifice cut their flesh in order to bring about the gracious reception of their offering and to elicit from their god an answer to their prayer. Some such meaning the custom must have had in the remote days of Israel. The prophet Hosea (vii. 14) reproaches the people because, contrary to the commandment of Yhwh, they made cuttings in the skin in order to obtain wheat and wine (the reading of the LXX. = ). A still earlier purpose than that of winning the favor of the Deity must be sought. Originally the custom was connected with the worship of the spirit of the departed. The tearing of the garment as a sign of mourning is a modification of the primitive ritual customs associated with the cult of the dead. In Assyrian is found the cognate verb for the Hebrew "saraṭ," in the sense of rending one's garment (see Delitzsch, "Assyrisches Handwörterbuch." s.v. "Sharaṭu"), the garment being a later substitute for the skin, which in primitive days was slashed and cut in honor of the dead. When the Law (Deut. and Lev.) prohibited this custom, the original association with the cult of the dead may no longer have been present in the mind of the people. It was, however, regarded as a heathenish practise, belonging to the service of Baal; and as such it was objectionable, and called for suppression. Tattooing (marking the skin by pricking in pigments) is even at the present time a custom much in vogue in the Orient. It seems also to have been occasionally practised among the Israelites and other peoples of Bible days (Jer. xlvii. 5, xlviii. 37). It is prohibited in Lev. xix. 28. For the custom of cutting the hair—also prohibited, and probably of similar origin—and its connection with funereal cults, see Hair. Frey, Tod, Seelenglauben im Alten Israel. E. G. H. I. Be. E. G. H.